Viva Las Vegas is an amazing romantic musical film of 1964 starring the greatest singer and actor Elvis Presley and beautiful fair-haired dancer and actress Ann-Margret particularly referred also to Casino Love Stories. The American movie was directed by George Sidney and with a screen written by Sally Benson. The musical is regarded not only by fans of the actors but also by critics, who considered Viva Las Vegas movie to be the best ever Elvis`s movie. 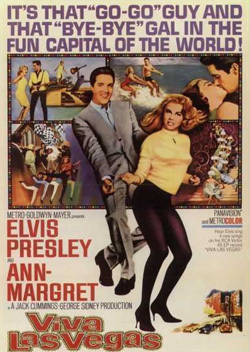 The attraction of the film is shared by both Presley and Ann-Margret. Apart from the fact Viva Las Vegas presents an interesting romantic story, it includes strong collection of ten musical 'song-and-dance scenes'. You should understand that soundtracks from this very film cannot be compared to those from any other even from Maverick. Recording took place in Hollywood on July 1963 at Radio Recorders. There were twelve songs recorded for the movie, but only 6 of them were issued on the records. The idea of the full-playing soundtrack album was not considered. Elvis Sings Flaming Star embraces a medley 'Yellow Rose of Texas/The Eyes of Texas', 'Do the Vega' and 'Night Rider' while 'Santa Lucia' is a part of Elvis for Everyone. Some of the songs became singles and set the top positions in different charts. However, some of these songs were not appreciated and covered the lowest positions in Presley`s career. At the time of Viva Las Vegas filming there were some ambiguous facts concerning chemistry between Ann-Margret and Elvis Presley. It was alleged that two stars had an affair in real life that was treated as one of the main buzz in all yellow pages. That was the most hard period for Priscilla Presley, actor`s wife, who was shocked with the announcement that Presley and Ms. Ann-Margret became engaged for the further marriage. However, it was probably another reason for these rumors spread by actors` colleagues - the attempt for promotion of the actress, Ann-Margret who was not really famous in Hollywood at that time. Anyway, there were no some obvious evidences for such statements.